When we see people at our offices in Chicago for couples counseling, they often report at least one of three major problems. 1.) “We argue too frequently and explosively” 2.) “We don’t talk enough and feel distant” 3.) 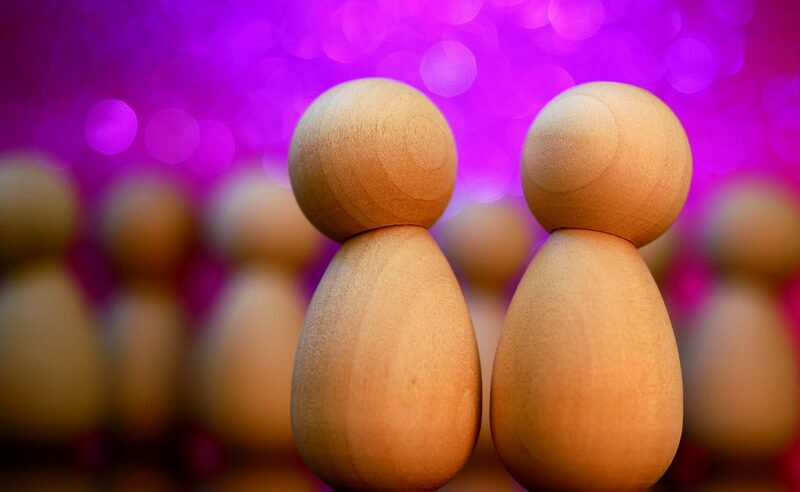 Or the catchall: “We have communication issues.” Throughout the course of couples counseling, we uncover the relationship between arguments and emotional distance is determined by how couples experience conflict in their relationships. Partners entering couples counseling for the first major problem listed above tend to be in the most acutedistress. Conflict is oftentimes painful and unsettling, and unresolved conflict is a primary source of resentment in relationships. For many, the word “conflict” brings up negative connotations of insidious issues that come between two loving partners. However, conflict is an inevitable part of a healthy, intimate relationship. More than this, conflict can be a powerful impetus for growth, understanding, and can even be an opportunity to become closer and experience increased intimacy with your loved one. 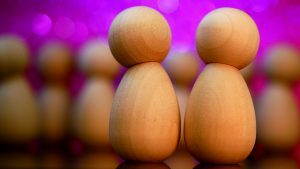 Despite this, we may find ourselves repeatedly feeling at odds with our significant other when our relationship becomes fraught with arguments or disagreements. Conflict is an opportunity for growth, but we often walk away feeling dejected or discouraged. If you find that you and your significant other have developed a tendency for repeated, routine arguments and conflicts that generally don’t end well, it might be time to change your habits and try something new. Here are some ideas for reshaping the dynamics that characterize your arguments, and finally conquer conflict not by avoiding disagreements but by arguing in a healthier way. That’s right—the first thing to do is to do nothing at all. When conflict arises, we often spring into action quickly. Instead, try pausing for a moment and actually noticing what is happening. How are you talking to your partner? What are you feeling? Conflicts (especially the ones that become sore spots for a couple) often occur in patterns, and the sooner that the couple is able to recognize these patterns, the sooner that they can begin to implement some changes. Repeated arguments can make for unpleasant routines, so noticing the patterns or the contributing factors to an argument can be a good place to start. When do you argue most often? Where? Over what types of subjects? Do you find yourself more prone to arguments when you’re hungry? Sleepy? Similarly, when are you most agreeable? What sorts of settings contribute to less arguments? What makes those conversations different? Conflict resolution is a process by which the disruptive cycle of communication or behavior in a relationship is changed, adjusted, or otherwise reshaped to make for a more harmonious relationship. In short, this means change. Spending time and energy arguing over irreconcilable differences does not benefit either member of the partnership, but can rather exacerbate the feeling of “spinning your wheels” that often develops from repeated arguments over the same issue. Unsolvable problems require acceptance; only changeable problems can be resolved. All too often, we forget that the goal of an argument is not about showing that you are right while the other is wrong, but rather to find a place of understanding and resolution for the both of us. When conflicts occur, its crucial that we don’t fall into the trap of playing “the blame game”. This means that we have to strip our arguments of those things that don’t help us or aren’t constructive—things like speaking in generalities (“You always do this,” or “I have never done that!”), bringing up unrelated issues or past arguments (“This is just like the time you…” or “You’re wrong about this just like you’re wrong about…”), or name-calling and other forms of derision (“You’re such a jerk,” or “We wouldn’t have to argue about this if you would just man up and deal with it.”). Oftentimes, these phrases are said in the heat of an escalating argument, when we are starting to become upset and overly stimulated. If that happens, it’s ok to take a break and return to the discussion when you or your partner has calmed down some. In fact, a 20 minute break in the middle of an argument can often reset the runaway train and lead to a productive conclusion to an otherwise chaotic conflict. By not jumping straight into defending or justifying his behavior, and instead, validating Jane’s feelings and experience, Joe not only helped defuse a high-stress conversation, but was able to reach an easy resolution that suited both members of the relationship. Sometimes we get so entrenched in the patterns and routines of our conflicts that it can become difficult to get out of the dynamics that developed over time. In these instances, it can be useful to see a professional—an impartial third party whose goal is to help couples break their bad habits while also learning new skills for negotiating conflict and, in turn, repairing and revitalizing the relationship as a whole. The Bergen Counseling Center are trained offers couples counseling at two locations in Chicago. Fill out the contact form on this page to learn more. 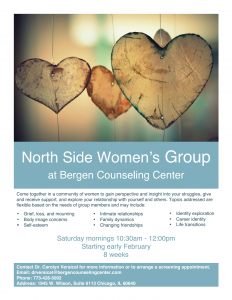 The Bergen Counseling Center is proud to announce the launch of a new women’s support group at our Ravenswood location! Dr. Carolyn Versical will be leading the weekly process group starting Saturday, February 11th from 10:30am – 12:00pm. Women often experience unique biological, environmental, and psychosocial challenges, and these concerns can have a significant impact on mental health and well-being. These meetings will create a space that allows you and other women to come together in our journey through life. In exploring the various topics particular to women, the group will help women understand they must nurture the self as well as others, and accept support and nurturance from other women. Additionally, this women’s group will allow you to explore how to deepen connections and satisfying relationships in your life. Specific group topics will be uniquely tailored to specific members in attendance. It is a space for women to express all emotions without judgement in a safe, supportive environment with validation from others who may have experienced similar feelings. The group will meet for a total of 8 weeks, and will address a variety of topics and issues relevant to women’s lives and relationships. Space is limited and is available on a first-come, first-served basis. To ensure a safe and consistent environment, membership will be closed after the initial meeting. Insurance compensation may be available depending on specific insurance plan and coverage options. If you are interested in attending or finding out more information, please contact Dr. Carolyn Versical via email or phone to schedule an free initial consultation. If you feel inspired to share this opportunity with others, click the link below for a downloadable pdf of the flyer at the top of the post. 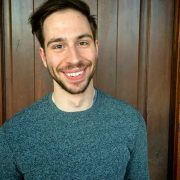 I specialize in treating clients surrounding a wide variety of concerns, including women’s issues, anxiety, depression, trauma, family of origin issues, relationship concerns, identity development, LGBTQ+ issues, grief and loss, career-related concerns, body image and eating disorders, and substance use and process addiction. I also have a special passion for mind-body practices (like yoga and mindfulness) as adjuncts to therapy, particularly with issues that arise during pregnancy and postpartum. You survived the holidays and made it to a new year! Whether or not you are a New Year’s Resolution type of person, we all have goals for self-improvement. You hear it from coworkers, family, friends, and partners every year: “New year, new me!”Yet our resolutions for the new year often fall flat by March. We may lose interest or motivation to continue, or may find that we don’t know how to accomplish the goals that we’ve set for ourselves. Whatever the reason, our new year’s resolutions often go unfulfilled, leaving us feeling discouraged, hopeless, frustrated, or “stuck in a rut.” Fortunately, researchers have come up with process for setting and achieving our goals that can help us break this cycle. Before reading further, give some thought to what you want to change in your life. Consider how you might finish the sentence: “In 2017, I want to…” As your read the tips below, reflect on how this may change the way you construct your goals for the coming year. The trick is a simple one: make goals that are SMART GOALS. This is a good example of a goal that many will espouse when January 1st rolls around, and for good reason—who wouldn’t want to be happier? The problem is that this goal is simply too vague. Specificity in our goals not only helps us define exactly what our goal is, but it helps to equip us with the tools to accomplish them. Goals related to fitness or weight loss are some of the most common New Years resolutions, and may often look like this. This one isn’t bad–it’s fairly specific and certainly feasible. The issue with this goal, however, is that in its present form, it’s not a measurable one. Fortunately, this is an easy fix if you get in the habit of asking the necessary questions: How often? How much? To what degree? As we begin to ask these key questions, the goal becomes more accessible and realistic. So maybe I want to start running for an hour on the weekends, or maybe I want to try weightlifting twice a week. I might want to try yoga after work every day, or I could connect with a personal trainer for a session every week. There is no quicker way to become discouraged in our progress toward our goals than to set out to attain the unattainable. We can quickly become burned out, frustrated, disappointed, and begin to feel like we have failed. This doesn’t do us any favors when it comes to making positive changes in our lives; we need goals that we can accomplish. This sounds simple enough, but many of us make a habit of telling ourselves “if I just work enough/try hard enough/want it badly enough, I can make this happen,” when in realty, there is much we cannot control. This resolution is a good example of this. Even if you work your hardest, there is usually no guarantee that securing a promotion is within your control. A more attainable goal might involve hitting certain milestones at work and then discussing the possibility of promotion with your supervisor or manager. This is a “smarter” because of everything we have discussed so far: it’s specific (I’m going to meet these specific criteria and hit these specific milestones, then open a specific discussion with my supervisor), it’s measurable (assuming the criteria to meet at work are clearly defined), and it’s attainable because of the way that these things all fall within your control. Specific? Sure. Measurable? Definitely. Attainable? Maybe—but it isn’t realistic. If we want to set goals that we can accomplish, we have to set goals that are realistic. This means setting goals that are not only attainable, but that we presently have the resources to achieve. Setting unrealistic goals not only increases the likelihood of failing to complete them, but can actually make failure an acceptable outcome. Despite this, some may still set goals that are unrealistically difficult because they may hold the mentality that shooting for the moon and missing still lands you amongst the stars; while this is can be true, encouraging the acceptance of failure can quickly become a slippery slope when it comes to effecting important and meaningful change. Time-sensitive, or time-bound goals are ones that come with deadlines. Without a deadline, we can easily procrastinate and delay our progress toward effecting change by justifying it with ideas such as “Well, I’ve still got time.” For a New Year’s resolution, the deadline might be the full year: “By the end of 2017, I want to have accomplished this.” A year is a long time to accomplish the goal at hand, however, and by October or November, we’ve likely forgotten all about our goal for the year. So try this: get specific with time-sensitive sub-goals. You want to write a novel by the end of 2017? How about we set a goal to outline the plot structure by March 1st, and have the first chapter written by the end of April? How about we set a goal to set aside 90 minutes each Saturday to exclusively focus on writing? These sub-goals are not only time-sensitive, but they also easily meet the rest of our “SMART” criteria. By setting these time-sensitive sub-goals, we not only help facilitate progress toward our larger goal, but can help build momentum by helping us achieve smaller successes en route to achieving our overall goal. The #1 most common New Years resolution from 2016 was to “live life to its fullest.” This is a great goal, but one that is too vague to ever be achieved. By setting goals that are S.M.A.R.T.—specific, measurable, attainable, realistic, and time-sensitive—we set ourselves up for success by not only giving ourselves an endpoint to move toward, but by outlining that path to success. By making demonstrable and beneficial changes that continue to help us evolve into the person we want to be, and that is one way to live our lives to their fullest.